Tim Mullooly: Welcome back to Living with Money. This is Tim Mullooly. On today’s episode, I am joined by Brian Portnoy. Brian is a PhD and a CFA and he’s currently the director of Investment Education at Virtus Investment Partners. 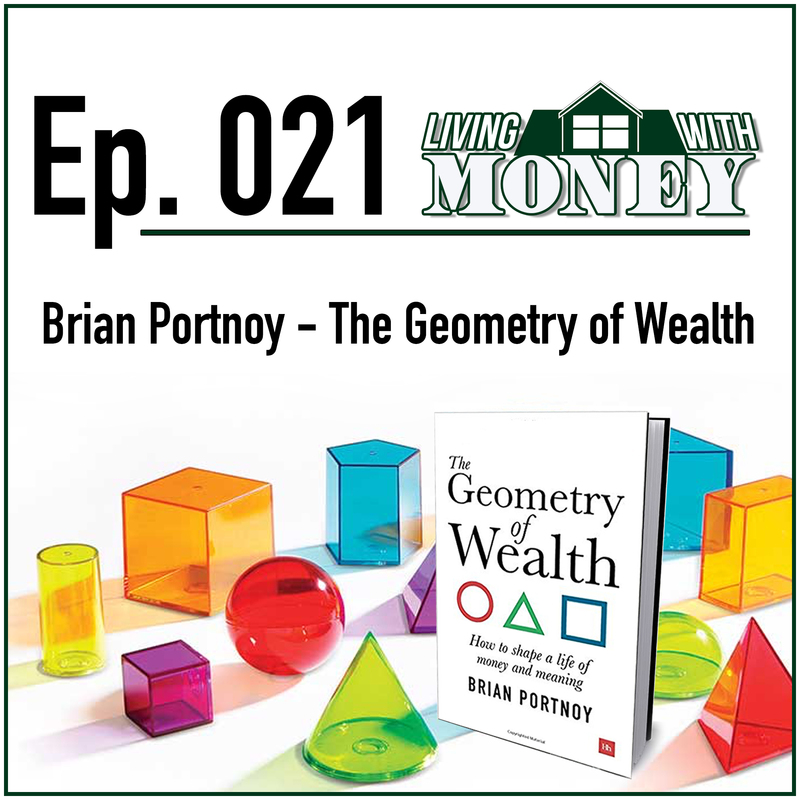 Brian is also the author of the upcoming book, The Geometry of Wealth, which comes out on June 11th but you can pre-order a copy now. Business Insider just put The Geometry of Wealth on an article listing the best 15 business books to read this summer, so definitely be sure to go pick up a copy of the book when it comes out. Brian, thanks for coming on the podcast. Brian Portnoy: Thanks, Tim. I appreciate you having me. Tim Mullooly: For our listeners out there, can you provide a little, brief background on yourself and how you got started in the industry? Brian Portnoy: Absolutely. As you mentioned, I’m currently the director of investment education for Virtus Investment Partners, which is a hundred billion dollar investment firm offering strategies of all kinds to financial advisors and institutions and other clients. How I got to this spot, I would describe as really non-linear. My background really is not in finance and accounting going back a couple decades. Mine was more of an academic set of interests going back to college and graduate school where I did do a PhD in the social sciences at the University of Chicago, and along the way became fascinated by markets. Not so much from a trading perspective, but more from history and sociology and politics of how markets operate. When I finished up my degree, I decided not to go into academia, and had an opportunity that was put in front of me for Morningstar, a local firm here in Chicago where I live, with a pretty quirky group of guys, at least back in the day. The first mutual fund analyst, Don Philips, he has a master’s degree in English or literature from way back when. By size up, I mean evaluate complex investment strategies. That led to the role at Virtus currently, and now the next book on a slightly bigger topic is, as you mentioned, coming out very shortly. Tim Mullooly: It seems like you’ve been all over the map in terms of the financial world within the hedge funds and now at Virtus, as well. You were talking about how you got interested in behavioral finance. Do you think, going back, you were talking about sociology and politics, do you think that kind of spilled over into your interest in behavioral finance? Brian Portnoy: Totally, and I love your phrase, all over the map. I think, maybe, a while ago I would take that as an insult, but now, I actually very much take it as a compliment. I think there’s something to recommend, just broad curiosity. There’s a whole different conversation to have about the nature of education and the importance of a broad liberal arts education which I strongly advocate, the way I happened to study and be trained by some pretty sharp guys at the University of Chicago was to think broadly across disciplines, whether it be in sociology or economics or anthropology or law or politics. That very much shaped who I am. It means at times I can be a little bit unfocused, but at other times it means that I might be able to embrace a topic or a discipline that wasn’t formerly familiar with me. I did transition from those graduate school days to a career in manager due diligence, which at some level makes no sense whatsoever, but at a deeper level, I think makes a ton of sense in terms of what it means to form and test a hypothesis. I used to form and test hypotheses about the way global capitalism works. Then, it actually was now challenge whatsoever to switch seats, and at Morningstar, ask or form hypotheses about whether or not a fund manager was skilled. It’s actually the exact same scientific methodology. Fast forward to today, being able to see what was out there with behavioral finance, starting Kahneman, Tverksy and Thaler, but now so many different people, it just came very naturally to take this next step in my career. Tim Mullooly: Right. I found, in my years, that finance kind of bridges the gap between a bunch of different industries. Like you were saying, it’s pretty easy to transition from one thought to the other, one industry to the other, and they all kind of tie together. In your book, the geometry of wealth, you talk about what it means to be wealthy. Usually on Living with Money here, that’s one of the last questions that we like to ask our guests, what the phrase being wealthy means to them, but let’s get started with that today, since that’s one of the main topics of the book. What does being wealthy mean to you? Brian Portnoy: Being wealthy is the ability to underwrite a meaningful life, however you choose to define that. That is the core thesis or central perspective of The Geometry of Wealth, that ability to underwrite a meaningful life, I sometimes call funded contentment. I contrast it quite starkly to being rich. In our money lives and in the book I get into this concept of money life, which isn’t just about investing. In your world and mine, so much of the conversation is about choosing the right investments, building the right portfolios, coming up with the best risk management program. To me, money life is something quite bigger and broader. It’s investing but it’s also saving and spending and even earning, and the combination of all of those working together. To be wealthy is to take all of that and direct our mindset and our actions toward being able to afford the things that really matter to us, as distinct from being rich, which is just accumulating more, more money, or more of the things that money buys for us. There’s just so much psychology that suggests that the quest for more is not particularly satisfying. There’s a whole literature in social psychology that refers to something as the hedonic treadmill or hedonic adaptation, this idea that we just get used to everything in life, both good and bad. Those who quest to be rich might find moments of pleasure along the way, but my view is that that does not add up to being wealthy. Tim Mullooly: Yeah, I was going to say, on the back of the book it talks about how angling to become rich is often unsatisfying, and like you were saying, an unsatisfying treadmill. Why do you think so many people just get wrapped up in trying to become rich, and they’re oftentimes surprised to find that that’s not actually what makes them happy? Brian Portnoy: Yeah, the psychology of money is such a broad and deep and fascinating topic. The first thing to recognize is that money is really, by far and away the most stressful element of most people’s day to day lives, more so than religion or politics or marital dynamics. Money becomes a lightning rod for many of the vulnerabilities and emotions that impact us on a day to day basis. As part of that, we do have this greed and fear cycle that’s wired inside each of us. It’s tapped to some of our deepest brain wiring, related to being able to survive in the world and moving toward opportunity and retreating from danger. There’s something about getting a little bit more that makes us feel good, not just in and of ourselves but relative to others. We’re naturally very competitive and so often becoming rich isn’t just about getting more from what we had yesterday. It’s getting more relative to our neighbors. I think you’ve seen, many of us have seen some of these studies that say that if you give someone a choice of making $50,000 while their neighbor makes $30,000 a year, versus a second scenario where that same person would make $100,000, so twice 50, but their neighbor makes $200,000, a majority of people would choose the first scenario. You have less money but you have more than others. I really don’t like the term irrational. I like the words human or normal. I think it’s just very normal for us to feel that way. I think those of us who strive to be successful in this realm, who try to be wealthy as I’ve defined it, we want to take seriously that, you know, we’re wired to make some pretty bad decisions and engage in some pretty painful emotions. Tim Mullooly: Yeah. I was reading an article the other day that was along the same lines of what you were referring to. It was saying, what’s worse than having someone win the lottery. It was having your neighbor win the lottery. There was a study done in Canada that said people whose neighbors won the lottery were more likely to go bankrupt, because they see their neighbor getting all this money, so they try and increase their spending to keep up with them. Brian Portnoy: I saw that, as well. I know we share a lot of the same Twitter contacts and so I saw that piece as well and I read it. If you think about it, it’s really remarkable. Tim Mullooly: Money does crazy things to people’s minds. In the beginning of the book, you make a comparison that hits home for me. I’m a big Harry Potter fan, but you compare money to Lord Voldemort, saying that both are feared by most and mentioned by few. If money touches every person in almost every single day of their lives, why do you think that money is such a taboo topic that people don’t like to talk about? Brian Portnoy: I think it stems back to the comment I made that it’s a lightning rod for so many of the emotional vulnerabilities that we have that we don’t want to speak about. Money becomes a proxy for many of the attributes or emotions that we think or are taught to think are really important, being rich, being beautiful, being famous, having a lot. These are things that sound good, but the quest for them, let alone achieving them, is not particularly enjoyable. One of the more influential lines … I’m not going to quote it because I can’t remember it, but I do recall an interview in which Danny Kahneman, who was the co-founder of behavioral finance back to the beginning a few decades ago. He literally wrote the book about the various biases that impact us. What was asked of him was, now that you know all this, do you act differently? Are you able to transcend or avoid or ignore all of these different cognitive emotional biases that you’ve been so eloquent in describing. He said no. This is who we are. We’re this way for a reason. It’s part of the design. It’s not a flaw. I think where behavioral finance comes in, at multiple levels, whether it be with individuals who are thinking about what they’re doing, whether it be with financial advisors, such as with yourself and your firm and the practice of so-called behavioral coaching, with institutional investors who are beset with these biases even though many of them think that they’re not. I think it just becomes a life work, and for me, a passion, and even a mission to talk about things, because a little bit of insight can go a long way in getting to a better place, especially when you’re working outside of your own mind. As Kahneman said, he can’t change who he is because nobody can. Our brains are the way they are for evolutionary reasons, but in working with others who can maybe keep us from being a worse version of themselves, things can work out a little bit better. Tim Mullooly: The title of the book is called The Geometry of Wealth, and that alludes to the story being told using three basic geometric shapes, the circle, the triangle and the square. Can you talk a little bit about what each shape represents and how they move the story along? Brian Portnoy: Maybe, just by way of background, why am I using these shapes and am I too clever by half in their use? I do a lot of writing and speaking and also think a lot about educational process and how people learn. Human beings tend to be very visual in the way that we learn, so generally pictures or images will resonate more than words. What I wanted to do was write a story that people could absorb on multiple levels. For example, at the end of the book there’s a recap. I saw Daniel Pink do this in some of his books and I think he’s a fabulous communicator so I basically copied his format. The recap summarizes the book in several ways. There’s a tweet, there’s a cocktail party summary, there’s a drawing, and then there’s summaries of sections, and then there’s summaries of chapters. You can get at this in a lot of different ways. If you can remember that, to me, the journey to wealth is shaped by, or I should say drawn by, these three shapes, the circle, the triangle and the square, which I’ll describe in a second, then you have a leg up over others in terms of understanding what it means to become truly wealthy. For me, the circle refers to defining our purpose in life. The triangle discusses setting priorities, that’s a couple chapters in the book, and then the square alludes to specific tactical decisions that we make. Those are the three steps on the path toward funded contentment. Defining your purpose, setting your priorities, and then making tactical decisions. Why those shapes? The circle kind of represents that it’s a round world. We think in terms of linear goal setting, but so much of life is falling down and getting back up and defining yourself and redefining yourself. To me, that process of growing and adapting is one of the joys of life. The circle kind of captures that, and I spent a fair amount of time in the book talking about that process of what it means to tell one’s own story, but then rewrite and edit that story as life moves on. The triangle refers to three priorities I see in our money lives. The first is managing risk, what I call protect, the second is what I call match, which is really kind of mapping up what you own versus what you owe, bread and butter financial planning that a lot of people do on a daily basis, and then the top of the triangle I call reach. I could have called it aspire. This idea that once you’ve got your money life in order and you’ve got things bedded down in terms of managing risk and having your assets and liabilities and balance, it’s a really great thing. It’s inspirational to reach for more in the right way. The triangle with three points or three sides alludes to three priorities, and then finally, there’s a square where I get into some details. It’s the most technical part of the book, but for those who are thinking about investing, per se, not the other parts of money life, the earning, spending and the saving, but investing, per se, I walk through four basic dimensions of where I think we can simplify the conversation and decision making process about smart investing. Tim Mullooly: Throughout that whole geometric process of the circle, the triangle and the square, you touched on the word adapt and being able to adapt. It becomes clear that the ability to adapt is paramount to navigating to your financial life. Why do you think that adaptation or being able to adapt to different situations is so important for people? Brian Portnoy: I’m not going to swear on your podcast, so I’ll just paraphrase by saying that the answer is that stuff happens. Life is messy, which I think’s great. Not always, and this process of adaptation is something that I think we should all embrace. When I consider the folks that are meaningful to me in terms of who I read and who I listen to and who I respect, it’s never people who are bragging. It’s never people who are talking about their victories. It’s people who have embraced the journey and can tell great stories about what was involved with being resilient, showing grit, sort of cutting through the noise and getting to a better place. There’s an old Japanese proverb that says, “Fall seven times, stand up eight.” I love that. That, to me, is such an elegant summary of what all of us go through in terms of trying to navigate the various elements of our personal lives and our professional lives. Most things are out of our control. So much happens that we can’t anticipate. No one can predict the future, so I think that ability to have a good head on your shoulders and respond wisely to stuff that comes your way is absolutely critical to this notion of contentment or even funded contentment, that idea of being wealthy. Honestly, my kids, I have three teenagers, it’s something that I’ve begun to talk to them about in, I think, age appropriate and personality appropriate ways. I want them to hustle. I want them to be curious. I want them to appreciate that things will not go according to plan, but that’s cool. How you respond is the important part. Tim Mullooly: What’s that Mike Tyson quote? It’s like, everyone has a plan until they get punched in the mouth. Tim Mullooly: Through life, things are going to happen, so it’s more important … Having a plan is important but it’s more important to be able to adapt to that plan. Otherwise, it’s pretty easy to get stuck in your ways if you’re dead set on doing something one way. You said that The Geometry of Wealth is your second book and the first book is called The Investor’s Paradox. I read that you said The Geometry of Wealth is sort of a prequel to your first book, and that it feels that you kind of wrote the wrong book first. Can you talk a little bit about the main points of The Investor’s Paradox and how you feel The Geometry of Wealth precedes it? Brian Portnoy: Yeah. The first point to make, honestly, is that I’m a total Star Wars nerd, so the idea of doing anything that could be considered a prequel sounded kind of cool to me. The Investor’s Paradox was sort of a summary of a previous stage of my career, as I alluded to at the beginning. I was doing investment research, portfolio management, analysis, especially in terms of manager due diligence, helping build portfolios of underlying managers for the institutional investors that participated in the funds that we built. That was my personal story. My day job involves, primarily, traveling the country, talking about behavioral coaching with financial advisors as behavioral coaching becomes a bigger and bigger part of the modern financial advisory practice. There’s a pretty great need for FAs to kind of learn what that’s all about. That’s what I focus on. One thing I’ve seen firsthand is that so many of the conversations between advisor and client starts at the end of the process. It’s about the market. It’s about the economy. It’s about the portfolio. It’s about specific line items in the portfolio. It’s, in my view, not a constructive dialog. Most of the time the client has no idea what’s being discussed, and most of the time the advisor is talking over the head of the client and it’s really the sound of one hand clapping. It’s not particularly productive. As the financial advice industry moves toward goals based wealth management and really away from a more narrowly defined brokerage industry, the idea of how to engage clients on what really matters is front and center. It’s easy to say that that’s front and center but it’s kind of hard to execute, especially for practices that have been so solely focused on buying and selling investment products and services on behalf of their clients. For me, The Geometry of Wealth is that step back. It talks at length, about half the book is about purpose and defining your purpose and how that ties to our financial lives. Those are hard, big, vague conversations to have, but I think that’s where it all begins. From there, once you have a sense of the life that you want to underwrite, the contentment that you want to fund, then you can begin to set some broad priorities, and then, within those priorities, you can make some specific decisions about the investments you want. Literally, the end of The Geometry of Wealth leads right into the beginning of The Investor’s Paradox. Tim Mullooly: That’s pretty awesome. It’s kind of like Star Wars, you were saying, how Episode Three ends where you see Darth Vader put on the helmet, and that’s kind of right where the first Star Wars comes in. Brian Portnoy: Something like that. I’d prefer we not make any reference to Episodes One through Three, but it’s your podcast so you went there. Tim Mullooly: You know, me being 25, those were the ones that I grew up with. Brian Portnoy: Yeah, yeah. From my generation to yours, I apologize. Tim Mullooly: Yeah. There’s so much information out there in the world today, it has become increasingly difficult for a lot of people to make simple decisions because they get overwhelmed with so much information. How have you personally been able to tune out some of the quote, unquote, noise, and how should individuals try and tune it themselves in their everyday lives? Brian Portnoy: Yeah, there’s a certain presumption in your question that I am able to tune out the noise, which I’m not. I’m like any other guy with a job and a family and a neighborhood and a television and a smartphone. I’m just battered with information on a day to day basis. The real answer is that there’s a couple levels. You can tune out. For example, I don’t watch financial television. I feel like that’s negative information. It’s stuff that you need to forget. It’s not helpful. I don’t really look at the market every day. There will be, maybe, a week or longer that I have no idea what’s going on. It doesn’t, frankly, interest me all that much. Maybe that goes back to my previous career well out of finance, but the day to day machinations of the market, I find incredibly dull. Part of me just is wired to not care that much about some of the day to day. That said, I do this for a living. I’m in the market. I work at an investment firm, and there’s lots of stuff that’s really, really interesting. I’ve created my own heuristics and some of my own little shortcuts that allow me to … I can take in the noise, but hopefully sort out a little bit of signal. I’ll give a very basic example, one that I talk to clients about all of the time, which is that, in my view, there are only three investment objectives. Just three, not two, not four. There are three. You want to grow your capital, and hopefully without taking too much risk. You want to generate reliable income in order to meet near term liabilities, and hopefully you do that without chasing yield. Third, you want to protect your assets from any number of dangers, including market declines and the corrosive impact of inflation. That’s it. I have worked with very wealthy families in the past and I’ve seen more complicated situations at the family office level, at the pension and endowment and foundation level. End of day, though, that growth and income and protection is all almost anybody needs most of the time. If you go to Morning Star, my former employer, I think it’s a fantastic organization, they provide a lot of information. It’s what they do. There are 110 investment categories that they have, or peer groups. That’s a lot. There aren’t 110 categories of problems but there are 110 categories of solutions. I do this for a living, so I’ve given it a fair amount of thought. People who work with financial advisors tend to have better outcomes, and it’s not because most of the time the advisor is a market guru and can find undiscovered gems and produce fantastically high, better than average results, it’s because the advisor is good at helping the clients to find their goals. It’s helping them turn off CNBC, and it’s helping them simplify their world. I think advisors should not shy away from being called coaches. That’s a really good thing. The best athletes in the world, the Tom Brady’s and the LeBron James, they have coaches, so it’s no mark of shame to have somebody alongside you through both good and bad to help you to a better place. Tim Mullooly: Right, yeah, and I think that that’s one of the most important questions that we can answer for clients is what’s important and what’s not and how can we help answer the question of, what are your goals. Along with that, there’s a number of big questions that gets answered in your book. One of them I picked out was, are the touchstones of a meaningful life affordable. The book comes out on June 11th, next week, so without giving too much away from the book, could you briefly touch on how one might identify these touchstones of a meaningful life? Brian Portnoy: Sure. Is this the part where I should just read chapter four from beginning to end? Tim Mullooly: No, we’ll leave that up to the people to pick up a copy and read it themselves. Brian Portnoy: There are, in my view, based on my reading and observation, four main touchstones of a meaningful life, sources of deep contentment. I’m not giving up too much to say that those are our social connections, our own ability to be independent and to really write our own story over time. Third is what I call competence, or some people would call mastery, the being really good at something that’s meaningful, a vocation, a job, a hobby, a passion. The fourth, which I consider a little bit of a catch all, I call context, which is the sense that you’re attached to something bigger than yourself in this world. That’s really dealer’s choice. I think historically, the number one context, touchstone has been religion or spirituality. Obviously a huge and important topic, but there’s also our nations and our tribes and certain ideas and certain passions that aren’t about ourselves. It’s about something bigger than ourselves, and a lot of the science that’s available, it’s just not anecdotes, it’s just not literature, it’s just not philosophy, but it’s actual research, shows that people who have connections, maintain and develop connections to something outside of themselves tend to be much happier. One of the ways to be most, I’ll call, constructively selfish in terms of finding contentment is to really not focus on yourself all that much. Tim Mullooly: For anyone listening out there, if you want to hear more about the touchstones of a meaningful life, dive into the book when it comes out next week. We’ve got a couple more questions here for Brian before we wrap up. Some people out there who might be in a bad financial situation or had some rough goings in life, the phrase true wealth might seem like an unreachable goal, like something far away in the distance that’ll never happen to them. What would you say to someone who thinks that they could never be truly wealthy? Brian Portnoy: I would say that wealth is not a number. There’s, obviously, some issues of basic sustenance that we all need to deal with. Thankfully, and you can look at the data from Steven Pinker and Enlightenment Now or you could look at the work of Angus Deaton, a Princeton economist who won the Nobel prize a few years ago, and a number of others, who talk about the absolute increase in material prosperity. If you have enough on your table to eat and you have a roof over your house, you’re not in a bad shape to really think about true wealth, that ability to underwrite a meaningful life. There are these touchstones that I just referred to. To some extent, it does take money to afford connection and to have independence so that you can do your own thing, or to generate the skills necessary to have a vocation that’s meaningful. One thing that does get lost in the shuffle of broader considerations in our society about personal growth and meaning and mindfulness is that money is an absolutely inescapable part of the topic. We would like it to be. It’s annoying. It’s frustrating. It’s scary, but it is part of the topic that we have to deal with. Where I hope the book can help a little bit with a lot of different people is to give them, number one, a vocabulary to think about what those sources of meaning are, and then recognize that, in most cases, there’s really not a specific number. There’s not some big pot of money that you need in order to attain these things. It’s much more a function of being in a daily flow with what’s meaningful to you, and then choosing to buy or own or underwrite the things, whether those be certain types of experiences, whether it be generosity to others, whether it be buying time, in the sense that certain conveniences that would be meaningful to you. These all mixed together, they’re all very much personal choices and personal considerations, but true wealth isn’t a number. It’s a mindset and it’s a plan, and when you combine the mindset and the plan, which is really the path between the three shapes, most people can end up in a really good spot. Tim Mullooly: I feel like that’s a really important thing for people to understand. For readers of the book, if they could only take away one thing from reading The Geometry of Wealth, would that message be the thing that you want them to take away or is there something else that you want people to take away from the book? Brian Portnoy: Yeah, that’s the big picture angle that I hope resonates with a lot of people, the idea that there’s a difference between being wealthy and being rich. Being rich is about a number, and it’s usually a number relative to others. It’s truly an unhealthy place to be, no matter what we see on television or on Twitter or in social media. Wealth is funded contentment. It’s that ability to underwrite a meaningful life. Almost anybody can afford a meaningful life with the right mindset combined with the right plan. Tim Mullooly: We talked about your first book, so obviously this is your second book. Would you say that writing The Geometry of Wealth was easier or more difficult than writing The Investor’s Paradox? Brian Portnoy: That’s a good question. I would say it’s probably a little bit easier, but I’d describe it as, different is a better word than easier. Different in no small part because it was just a different point in my life. When I wrote The Investor’s Paradox, I was really wondering out loud about a lot of different things in my life. I would even say it was my version of a midlife crisis. I didn’t go for the fast cars or some other stupid decisions. I holed myself away in my office at home and wrote a book. This book, the second book, didn’t stem out of the same life circumstances. I would say, even though I’ve been gratified with some of the feedback on The Investor’s Paradox, I wrote that book for me, and I would say that I wrote this second book for others. Tim Mullooly: That’s awesome, and writing a book is no easy task. I always say that to every author. I commend people for writing books. It seems like a very in-depth process, and this book seems to have a lot of great value for the readers out there, but for you, what would you say is the most rewarding part about writing this book? Brian Portnoy: I guess I have two indulgences. One is learning and the other is teaching or sharing. When I write, I feel like I’m a pig in mud. I love it, just sitting down in my study at home or at the office or in airports. It doesn’t matter. If I’ve got a keyboard or a notebook in front of me and I can be sketching out ideas, then I’m a pretty happy camper. The book, all in, is about 53,000 words, so it’s substantially shorter than my first book, and hopefully that’s a length that’s not too intimidating for people. In the context of publishing 53,000 words, I probably threw out 45 or 50,000 words. There’s some pleasure for me in just deleting crappy writing. There’s a great book on writing by Anne Lamott called Bird by Bird. Again, I’m not going to swear on your podcast, so I can’t give you the exact name of the chapter, so I’ll just call it crappy first drafts. She’s got a whole thing on crappy first drafts. It’s really liberating to read. To me, that process of engaging in my own head with things that seem important is super fun, and then the flip side is, you produce the thing and you put it out into the world, which, it’s not out there yet, but we’re right on the cusp. It’s cool that you get to talk about these ideas with other people and it’s very flattering and it’s very rewarding to be able to put your ideas out into the world. Tim Mullooly: Congratulations on the book. For the listeners out there, The Geometry of Wealth comes out June 11th. That’s next Monday, so you still have time to pre-order it and pick up a copy when it comes out. That’s all the questions we had for today. Brian, thank you so much for coming on the podcast. I really appreciate it. Brian Portnoy: My pleasure. These were great questions and it was a great conversation, thank you. For anyone listening out there, in the show notes on our website, we’ll link to The Geometry of Wealth. We’ll also link to Brian’s website where you can learn a little bit more about him and find The Investor’s Paradox and The Geometry of Wealth. We’ll link to all that in the show notes. Thanks for listening, and we’ll see you on the next episode.